A must-have in every skin care regimen, our best-selling Collagen Booster with Copper Complex stimulates collagen production for maximum firming and tightening of the skin and restores a natural glow and suppleness to aging or lackluster skin, helping to improve and promote an even complexion. Copper Peptide plays an essential role within the fibroblasts to promote healing. Hydrocotyl and Coneflower Extract improves and maintains the skin's suppleness by increasing skin firmness and density. Panthenol works to moisturize skin and prevent dehydration. Apply evenly to face, neck and décolleté. 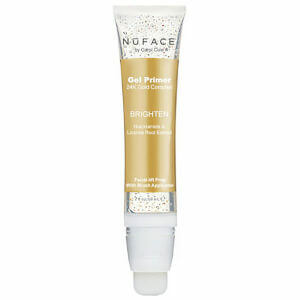 When layering, use Collagen Booster after all other NuFACE Skincare and before your NuFACE treatment. For maximum effectiveness, the Collagen Booster should not be used in combination with the Lifter Serum. Water (Aqua), Lecithin, Dipalmitoyl Hydroxyproline, Beta-Sitosterol, Linolenic Acid, Tocopherol, Sodium Ascorbate, Mannitol, Butylene Glycol, Centella Asiatica Extract, Echinacea Purpurea Extract, Aloe Barbadensis Leaf Juice Powder, Panthenol, Yeast Polysaccharides, Carbomer, Triethanolamine, Phenoxyethanol, Caprylyl Glycol, Ethylhexylglycerin, Hexylene Glycol, Decarboxy Carnosine HCL, Copper PCA, Disodium EDTA.